Thalassinoides covers a glacially-polished horizontal surface in the Grand Rapids Uplands (scale bar is in centimetres). The concept of trace fossils is probably somewhat foreign to most people. 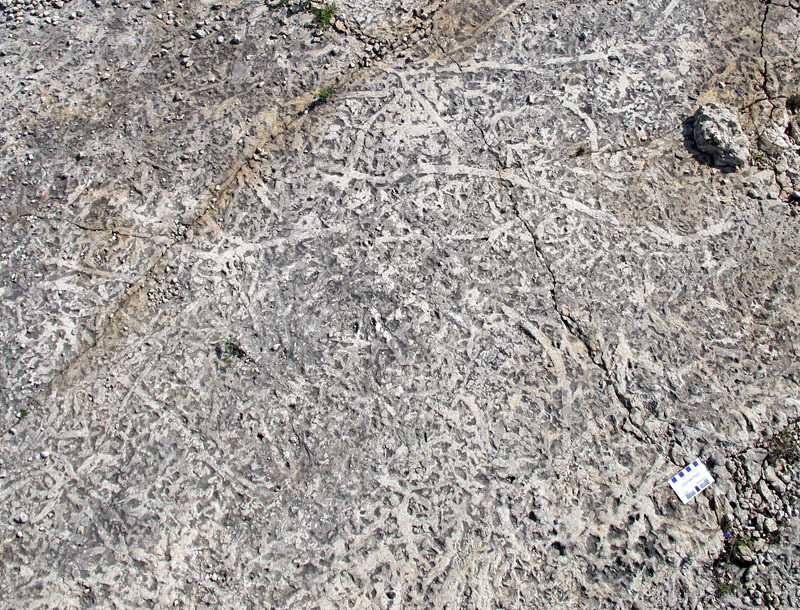 People may not think often about preserved evidence of ancient biological activity, but many are quite familiar with certain sorts of tracks and traces. If you live in southern Manitoba or have visited buildings such as the Canadian Parliament Buildings in Ottawa, you will have seen the trace fossils that give the Ordovician Tyndall Stone (Red River Formation, Selkirk, Member) its characteristic mottled or “tapestry stone” appearance. 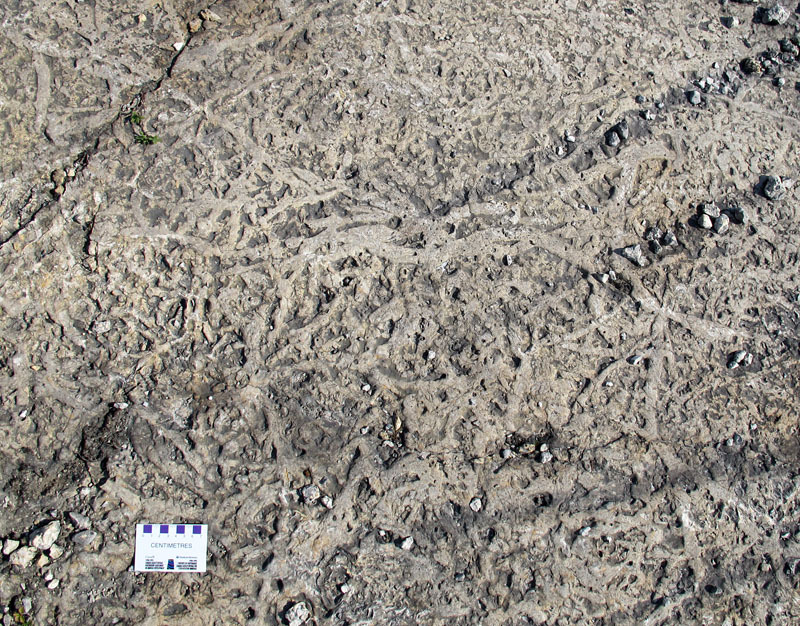 These mottles are actually the branched boxworks of preserved burrows, often assigned to the ichnogenus Thalassinoides. Ordovician Thalassinoides often occurs in rocks deposited on well-oxygenated normal marine seafloors, commonly associated with body fossils. 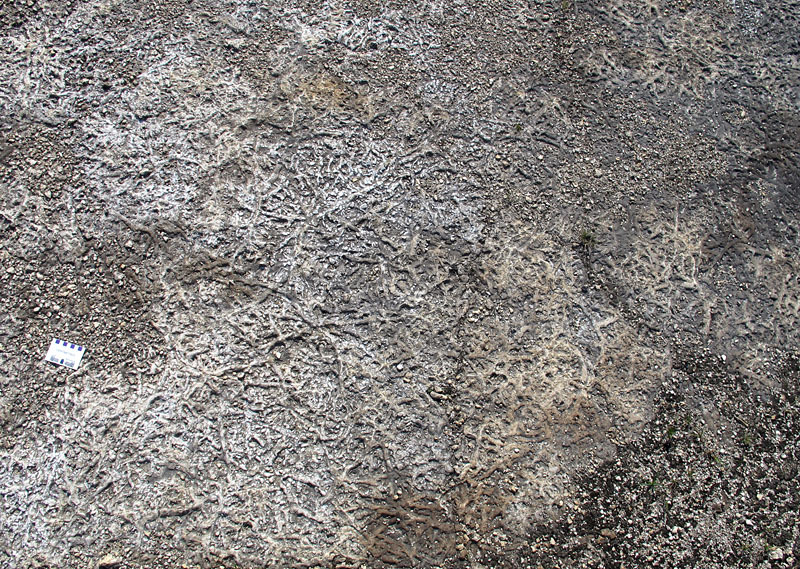 The mottles of this bed-parallel Tyndall Stone slab, photographed at the Garson Quarries, occur with a horn coral (lower left), gastropod (snail, centre left), and cephalopod and gastropod (upper left). 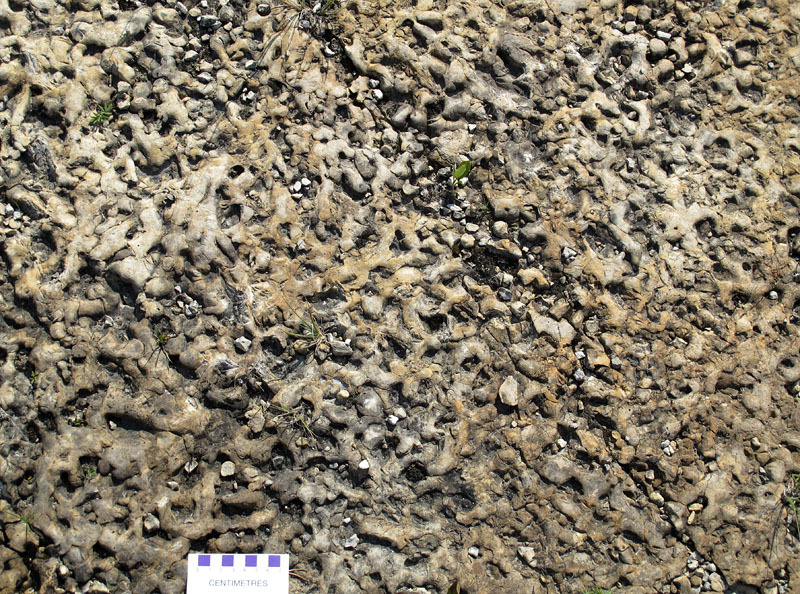 The dark dolomitic burrow mottles are very obvious against the surrounding limestone (calcite) matrix. The lens cap diameter is 56 mm. The beautiful mottling of Tyndall Stone demonstrates the existence of tremendous numbers of organisms burrowing into an ancient seafloor. Although the Thalassinoides in this stone is impressive, it is certainly far from its only occurrence in the rocks of Manitoba. Revisiting sites in the Grand Rapids Uplands last week, I had the chance to photograph stone at one locality where it contains burrows even more abundant than those seen anywhere in Tyndall Stone. Not only are they abundant, but their preservation is such that the surrounding stone weathers away in places, leaving a near three-dimensional meshwork of burrows visible on the rock’s surface! This glacially polished surface in the Grand Rapids Uplands has been somewhat weathered, and the burrows are beginning to stand out in three dimensions. 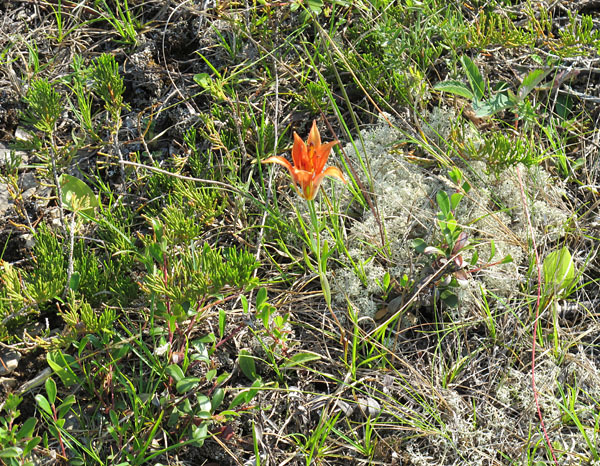 This remarkable exposure, some 500 kilometres north of Winnipeg, is part of the Gunton Member of the Stony Mountain Formation (Upper Ordovician, upper Katian, about 445-447 million years old). It is a bit younger than Tyndall Stone, but still within the same period of geological time. The rock is exposed on broad open surfaces that had been scraped smooth by the Ice Age glaciers, and more recently “re-cleaned” by bulldozers during development of the hydro and highway rights-of-way. In the years since that last human work was done, they have been gently washed by the rain, and somewhat less gently weathered by the cold season’s frosts. 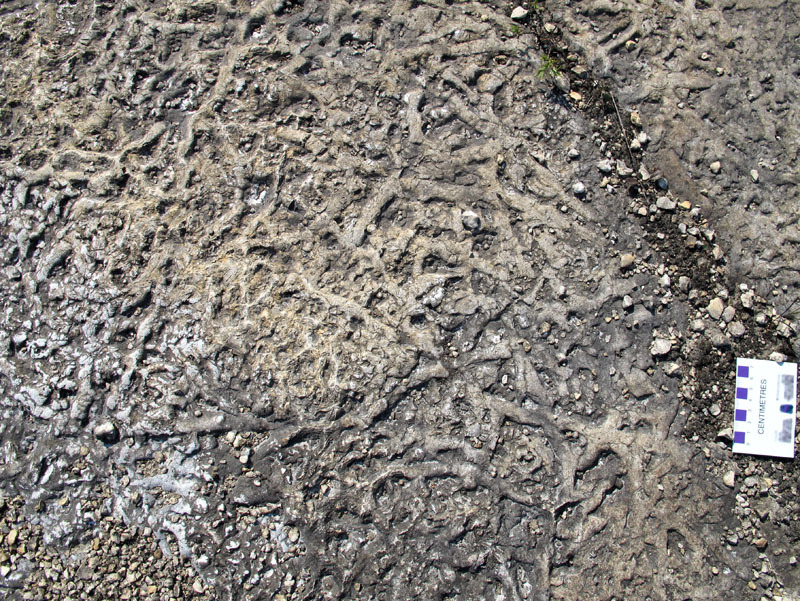 In this more weathered surface you can see multiple levels and scales of burrows. 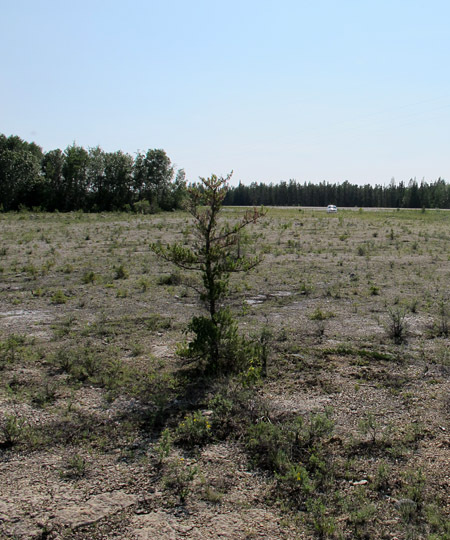 When we first visited this place in about 2004, many of the bedding plane surfaces had already been broken up and had begun to turn into a plain of gravel. We feared that the beautiful burrows would soon be lost to science, and returning this year I was afraid that there would be no bedrock left to observe. The rock is, however, tougher than that. Right now some of the surfaces are at the optimal stage of weathering: the slightly softer dolostone around and between many of the burrows has been removed, leaving the burrows standing in beautiful three-dimensional relief. The weathering has progressed so far in some instances that you can see down between burrows to those in the layer beneath. Sadly though, some surfaces have progressed past this point, and are spalling off to the extent that they are better road fill than they are evidence of ancient life. Gastropods such as this large Maclurina are among the body fossils occurring between burrow mottles. But what teeming life do these immensely abundant burrows provide evidence of, anyway? The truth is that we don’t really know. 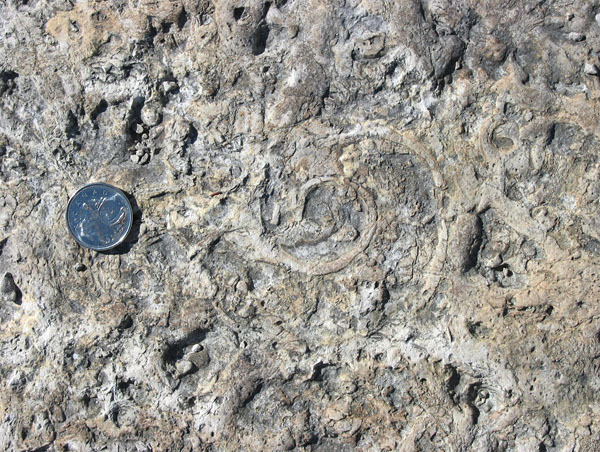 Thalassinoides-type burrows in younger rocks were probably most often made by crustaceans such as thalassinid shrimp. These sorts of crustaceans are, however, not known as far back as the Ordovician, and it has been suggested that Ordovician burrows may have been made by asaphid trilobites. And maybe they were made by sea anemones or polychaete worms? There are still so many questions about the world for us to answer! It is lily season in the Grand Rapids Uplands. Cherns, L., Wheeley, J.R., and Karis, L. 2006. Tunneling trilobites: habitual infaunalism in an Ordovician carbonate seafloor. Geology, 34: 657-660. Coniglio, M., 1999. Manitoba’s Tyndall Stone. Wat on Earth: Waterloo University Earth Sciences Newsletter, Spring 1999, p. 15-18. Gingras, M.K., Pemberton, S.G., Muehlenbachs, K., and Machel, H. 2004. Conceptual models for burrow-related, selective dolomitization with textural and isotopic evidence from the Tyndall Stone, Canada. Geobiology, 2: 21-30. Kendall, A.C. 1977. 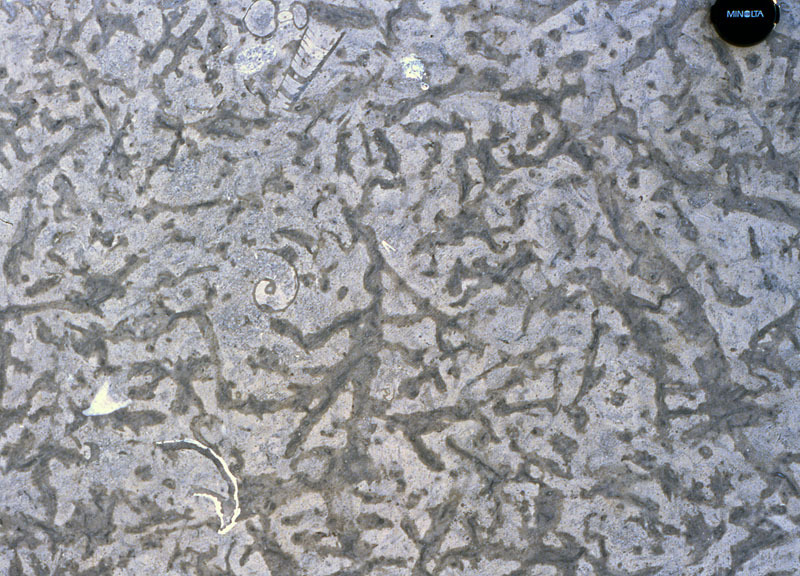 Origin of dolomite mottling in Ordovician limestones from Saskatchewan and Manitoba. Bulletin of Canadian Petroleum Geology, 25: 480-504. Young, G.A., Elias, R.J., Wong, S., and Dobrzanski, E.P. 2008. Upper Ordovician Rocks and Fossils in Southern Manitoba. Canadian Paleontology Conference, Field Trip Guidebook No. 13, CPC-2008 Winnipeg, The Manitoba Museum, 19-21 September 2008, 97 p.
I was especially taken in by the second one as the patterns left by the gastropods (if I’m understanding things correctly) are amazing. Nature’s canvases uncovered just like when scientists uncover parts of DaVinci’s paintings and find some of his pencil sketches. Beautiful! Thank you for that comment. Those are actual fossilized gastropods in the Tyndall Stone, but because the rock is cut from quarry faces (using gigantic saws! ), one usually sees sections through the various fossils, rather than their surfaces. It is a great exercise in three-dimensional thinking to figure out what some of the fossils are, if you get a particularly weird section through them! Great story, and great pics, up to your usual high standard! Tyndall stone is also the feature of the newish building (1985?) that houses the Dept. of Geological Sciences at the University of Saskatchewan, including their small but delightful natural history museum that features dinosaur replica skeletons, including a T. rex (of course!). The designers deliberately chose stone that included body fossils of gastropods and cephalopods etc as well as the ichnofossils, so its a treat to just look over the facing slabs in the museum benchs, walls and also the corridors of the Department and find these treasures. Good old BU also has some nice Tyndall stone in our Clark Hall, the original Brandon College building. Thanks Dave. I really need to do some systematic posts about Tyndall Stone and its fossils. I hope your summer is going well! You may recall that the fireplace at my house features Tyndall Stone.